Hawai'i Watercolor Society's annual Members' Show juried by watercolor master Stephen Quiller. Talk with the artists, indulge in outstanding artwork, and get inspired! The event will be held from 5-7 p.m., and the award ceremony will start at 6. The Hawaii Watercolor Society is open to anyone interested in the art of watercolor. Our mission is to nurture and stimulate interest in water media through education, exhibitions, and collaboration with other organizations, associations, and individuals. All HWS members receive a monthly newsletter in the mail. The HWS Newsletter is a great source of information for shows, watercolor workshops, paint outs, and exhibitions. Annual membership dues are $40 dollars a year. To join us, please download membership application form print out, fill in and mail with enclosed check. 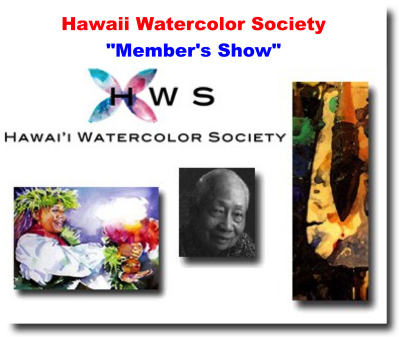 The Hawaii Watercolor Society was founded in 1962 by Hon Chew Hee. He was honored as Artist of the Year by the Hawaii State Legislature in 1986. In 1987, the Society dedicated its 25th Silver Jubilee Exhibition to him. Given Honorary Life Membership in recognition of his service to the society, Hon Chew Hee passed away in 1993. In his memory, a Best in Show award is given at the biannual Hawaii Watercolor Society's shows. In 1991, in recognition of their long service to our organization, HWS gave Honorary Life Membership status to Karin Latham and Jeanne Robertson. In 2004, in recognition of their long service as Workshop Chairs, HWS gave Honorary Life Membership status to Helen C. Iaea and Rita J. Gustie.